This 6-in-1 meter replaces 6 traditional meters to make your work simpler and more efficient. This newly designed digital light-weight device gives you long-lasting power with accurate measurements. This is a brand new CEM DT-61 meter. This industrial digital multi-function environment meter is CE certified. This 6-in-1 meter replaces 6 traditional meters to make your work simpler and more efficient. 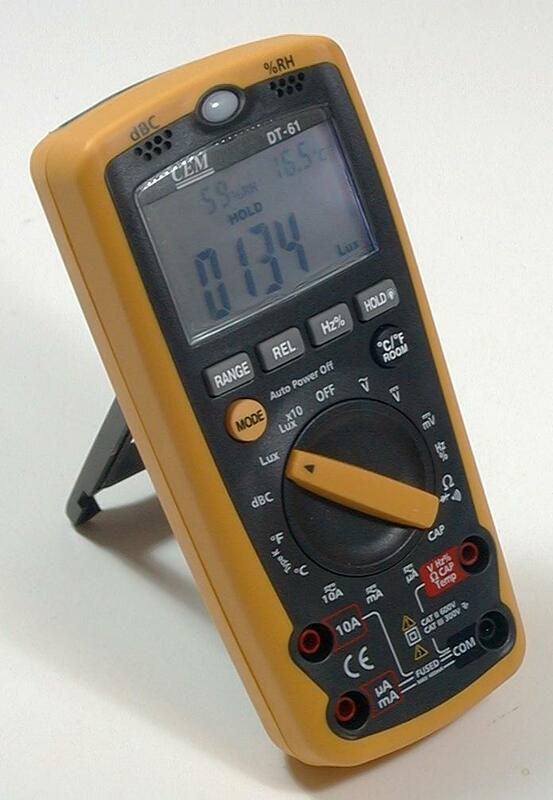 This newly designed digital light-weight device gives you long-lasting power with accurate measurements. The built-in multi-meter, NCV (Non-Contact AC Voltage) indicator, Sound level, Light, Humidity and Temperature measuring functions replace meters worth over $500. The digital multi-meter function includes ACV, DCV, ACA, DCA, resistance, capacitance, frequency, duty cycle, diode and continuity tests. * Condition: Brand new in retail box. * 6-in-1 multi-function multi-meter, Light meter, Sound Level meter, Relative Humidity meter, Temperature meter and NCV indicator.